What's going on in Selly Oak Park? Every time you blink another sculpture appears. This log settee is the latest arrival. I wonder what's next? Over the past few weeks and months you may have noticed different features appearing in the Park - the Cyril Squirrel willow sculpture, wood carvings, seats, finger posts, plaques, interpretation boards. These are all part of a Nature / Art / History Trail which has been co-ordinated by Tracey Hewitt our Neighbourhood Manager, with much support from the Friends of Selly Oak Park. The nature Trail is now nearly complete and will be offically launched on 11th March 2011. P.S. A date for your diary - the Selly Oak Festival, in the Park, is being planned for 18th June 2011. We already have attractions booked. Please contact us (details on the right) if you wish to participate with a stall or similar. 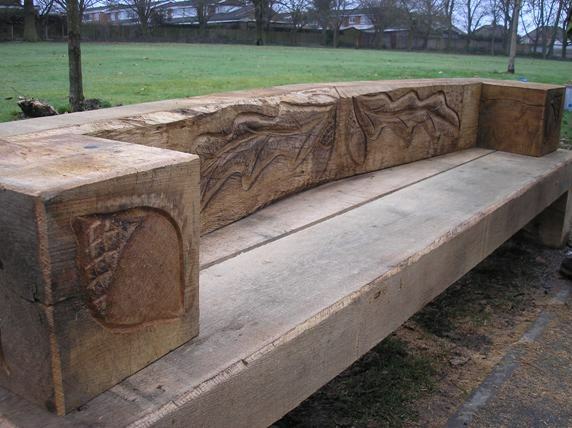 We are very pleased that five new benches have been installed in the park. Three of these were paid for by the Friends (using money given in sponsorship by Robert Wilkinson's Fun Fair) and two by a grant from the City's Community Chest scheme.